"As I moved on to the bolster standards, the evidence pointing to an identifiable maker continued to mount." When it comes to unlocking life’s mysteries, archaeologists, historians, explorers and scientists have long shared a similar passion for discovery. To that point, it can be a painfully slow task to connect the faded dots of history with the missing pieces of time. But, the anatomy of research has its own set of rewards and every now and then an experience comes along that changes a way of thinking while re-energizing even the most jaded adventurer. So it was on March 28th, 2007 when I walked through the doors of the 21st century and came face to face with the world of my emigrant ancestors. The day started out as a cool, rainy morning in Iowa for my family and me. We were returning from an antique equipment auction where we had been told of a museum in Kansas City that housed a large collection of pre-Civil War artifacts. 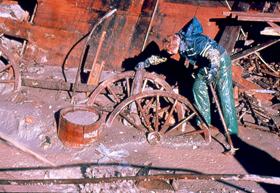 The rare materials were recovered from an old river steamboat called the “Arabia.” Unearthed in 1988, the boat had originally been loaded with more than 200 tons of supplies bound for territories west. 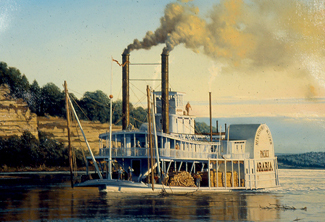 It was late August 1856 when the 171 foot side-wheeler left the docks at Saint Louis and began the slow journey west through the dangerous and unpredictable waters of the Missouri River. Ultimately destined for Sioux City, Iowa, the steamer made a number of scheduled stops along the way, including the intermediate port of Kansas; more modernly known as Kansas City. After leaving Kansas City, the Arabia continued west, but not for long. Before the cargo could arrive at the next stop, it would be violently attacked. This watercourse was anything but a peaceful, lazy river. In fact, according to museum curator, Greg Hawley, the Missouri in the 1800’s was more dangerous to navigate than a flight to the moon is today. Filled with untold obstructions and floating debris, it was a minefield on a mission for victims. Such was the scene as the Arabia unknowingly approached the sharpened snag of a giant walnut tree anchored just below the water’s surface. Without warning, the waterlogged torpedo ripped open the hull and exploded the cargo holds, claiming literal fortunes as its own. While all passengers – except for an unfortunate mule – were able to make it to shore safely, the Arabia was immediately claimed by the river and for the next 132 years the boat sank deeper and deeper into the clutches of the old river bed. 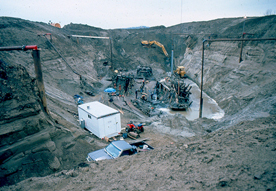 Over time, the river changed course and the 1988 discovery found it a full half mile away from the current river channel and 45 feet below a Kansas cornfield. A friend had mentioned that he thought an old linchpin wagon gear had been among the items found during the massive recovery efforts. While I was interested, I’ve seen several of these vintage vehicles in museums and wavered on whether I wanted to spend time on this one. As it turned out, the ‘Arabia Steamboat Museum,’ was just a few short blocks from the highway we would be traveling so we decided to make the stop. I could not have been less prepared for all I was about to see. Arriving at the museum, the building and its design evoke an impressive air of distinction while lending a curiously comfortable feel of another time. 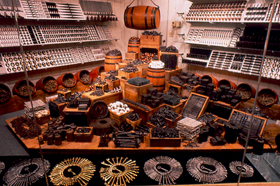 The privately-held museum is said to house the largest collection of pre-Civil War artifacts in the world. In spite of that lofty distinction, it is worthy to note that the families responsible for locating and securing such a significant archaeological find are down-to-earth Midwesterners with a sincere appreciation for U.S. history and the sacrifices shared in the making of America. The tours start with docents extolling some history on the museum and its contents, followed by an introduction to a short film on the project. Visitors are then allowed to travel at their own pace throughout the facility. Watching the film, the immense variety of goods and sheer quantity of materials is overwhelming. 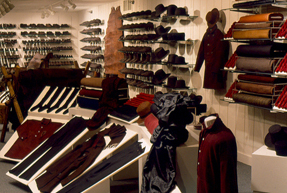 Everything from pickled foods to beaver hats, rubber boots, nails, saddles, buttons, irons, champaign, clothing, knives, guns, gold-plated powder flasks, lead, tools, a crate of printing type, fine European china, jewelry, glass windows, perfumes, children’s toys – you name it. There was even a pre-fabricated house on board the steamboat! It’s an amazing cargo that some say is the “King Tut’s Tomb of the Missouri River.” Packed on board the steamboat in 1856, the materials were meant to provide much needed supplies for the increasing wealth and growing opportunity in the West. Leaving the small museum theater, I was interested to see the artifacts up close and take a few snapshots of the wagon gear on the way through. Almost immediately, I noticed some wooden wheels positioned behind the protective glass enclosures, so I moved ahead of the tour group. As I approached the gear, I was taken aback. This was no linchpin wagon. It had cast thimble skeins and nuts on the axles. While the iron reinforcements and woodwork were clearly from an early period, the thimble skeins sported design standards that appeared almost identical to 20th century wooden wheeled farm wagons. It was an important discovery for our Wheels That Won The West® archives since every modern source I was aware of had always dated the earliest use of this technology to 1860. 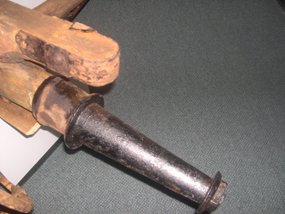 While earlier examples of wooden axle wagons fitted with iron sheaths or clouts are relatively well represented, the existence of an 1850’s mass-produced cast thimble skein wagon is quite another story. And, while 1856 is only four years earlier than the previously touted 1860 date, it clearly places the use of this advanced vehicle engineering right in the heart of some of the heaviest freighting and emigration into the west. A quick search of the U.S. Patent Office files shows indications that patents for improvements to a similar thimble skein were applied for as early as 1850. However, it is clear that this gear represents one of the earliest known uses of a cast thimble skein and is quite possibly the earliest existing factory-produced western wagon in America. While I continued to scan the gear, I began to notice other familiar construction features and more elaborate design traits. Fullered metalwork on the fore portions of the circle irons, scalloped perimeters to the front and rear hounds and a level of craftsmanship that conveyed a deep sense of pride and quality. In a number of ways, it was a very close facsimile to a particular wagon brand historians and collectors are all too familiar with. As I moved on to the bolster standards, the evidence pointing to an identifiable maker continued to mount. At the top of the 18” standards was a highly distinctive blacksmith made tubular loop. 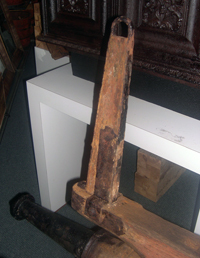 Running down the vertical pieces, the flattened ironwork hugged the wooden stakes and the elbowed reinforcement bracing at the base provided further evidence. 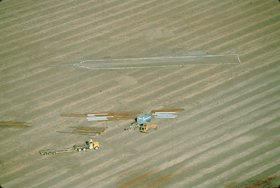 When it comes to early farm, freight, and ranch vehicles, this design coupled with the fullered metalwork and scalloped wood sections bear striking similarities to the construction design of one man – Peter Schuttler. His vehicle designs were uniquely artistic and clearly overbuilt. It was all for good reason as the lessons of hard times had taught him the value of quality goods and, in its 82 year history, his company never sacrificed that philosophy. To be sure, some of these same characteristics do exist on other known brands and even the occasional 18th and early 19th century blacksmith-made vehicle. However, the existence of all of these design and construction elements in one gear is a temptingly positive indicator pointing to the legendary Chicago maker. 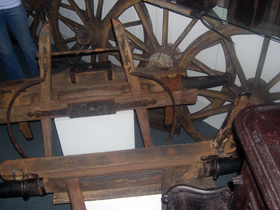 As an historian of early western horse drawn vehicles, I was intrigued to see identifiable traits to a wagon gear that – while the years had eroded most of the paint – was still in remarkably sound condition. Even after remaining underground for well over a century, the piece is in such a quality state that even the hand scribed tool marks from a scoring knife appear almost as fresh as the day they were scratched into the wood. If this is an actual “Chicago Wagon” gear, Schuttler would have been in his mid-40’s during this timeframe. Standing next to the vehicle, it’s easy to get the feeling that this once-vital workhorse has somehow cheated time. The perfectly square-edged tires and crisp corners on virtually all of the wood parts clearly indicate the vehicle was never used. It’s a fact hard to digest considering the 150 year age. But then, most all of the countless other artifacts in the museum also seem to defy the fading impact of a bygone era. The Arabian time capsule has been good to this collection and we are all the richer for it. 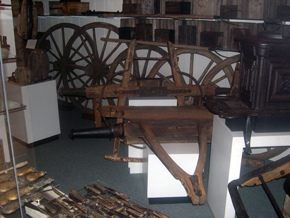 Enamored by the gear, the potential significance of this find began to dawn on me so I sought out a museum staff member and asked her what they knew about the wagon gear’s background. Other than being packed aboard the boat with the other materials, she nor the curator were aware of any other history. As I began to explain my supposition that Peter Schuttler was a very qualified candidate as the original maker, I also shared the firm’s prominence on the western frontier and that the company had long claimed to be Brigham Young’s most favored vehicle brand during the Mormon exodus to Utah. So much so, that by 1855, the Mormons were reported to be using his vehicles extensively. At this point, she stopped me and related that through the museum’s research, they knew that the boat was heavily laden with supplies for Mormon travelers moving west. For an historian always looking for new information, this was yet another valuable point. While Schuttler had struggled to gain a foothold in his first few years of wagon making, by the mid-1800’s, he was a fearsome competitor and aggressive marketer. Period accounts have him finishing 1800 wagons a year during this time while also serving as a major supplier to a number of St. Louis freighting firms and a continual stream of emigrants moving west. During our research for this story we spoke with Doug Hansen, a noted authority in early western vehicles. After reviewing a series of photos, Hansen concurred that the idea of Schuttler as the maker has genuine merit. In fact, he seemed particularly struck by the overall design of the bolster standards. Still, he reinforced that with so little in the way of period examples to compare the piece with, it may not reveal all of its secrets so easily. Ultimately, the gear is a remarkable find – whoever the maker was. This very early use of a cast thimble skein and the notation of its existence as perhaps the earliest known factory-produced western wagon give it a definite celebrity. With initial indications leaning so favorably toward a Schuttler label, one more fact is abundantly clear; the Arabia steamboat continues to show herself as a literal treasure trove of pre-Civil War western artifacts. Perhaps the best news is still to come. With even more sunken steamboats from the same era yet to be located, it’s quite possible that more vehicles have escaped the passage of time and are simply waiting to be rediscovered. It’s an intriguing thought and who would say it’s impossible with such an amazing find on the Arabia? After all, dreams have a way of fulfilling their destiny, even if it takes a century and a half to get it done.